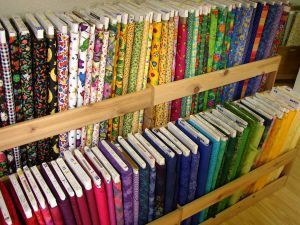 It might surprise you to hear that there are two very different fabric stashes that quilters develop – one is the Quilt Fabric Stash (QFS) and the other is called Quilt Fabric Collection (QFC). Most quilters have both stashes in their cupboards and drawers and aren’t even aware of the fact. The difference between a Quilt Fabric Stash and a Quilt Fabric Collection is one you will cut into without any quibbles, the other you wouldn’t dream of putting a rotary cutter or pair of scissors to. I feel I can safely say that 95% of quilters everywhere have a stash of fabrics they have purchased in the past, but have never been able to bring themselves to cutting into it. And I’m here to tell you THAT’S OK! My stash on the other hand is made up of all manner of fabrics that I intend to cut into. I’m very lucky to have a large pantry cupboard for my fabric stash storage and I keep my fabrics in colour ways for easy choosing. I store the fabric in lattice sided laundry baskets. I don’t fold the fabrics, just plonk them into the right basket and being a see through container, I can get to the fabric I want pretty quickly. You might be aghast that I don’t fold my fabric when storing – I’m going to have to iron it anyway before I cut, and when I’m on a mission to find the right fabric, I behave a little manically and don’t have the patience to gently fold each piece up. That’s me anyway. It was after about ten years of collecting a stash, that I realise I had certain fabrics that were “special”. These fabrics were usually obtained after walking into a patchwork shop an immediately being smitten by a certain fabric that I simply HAD to have, even though I had no idea how I was going to use it. 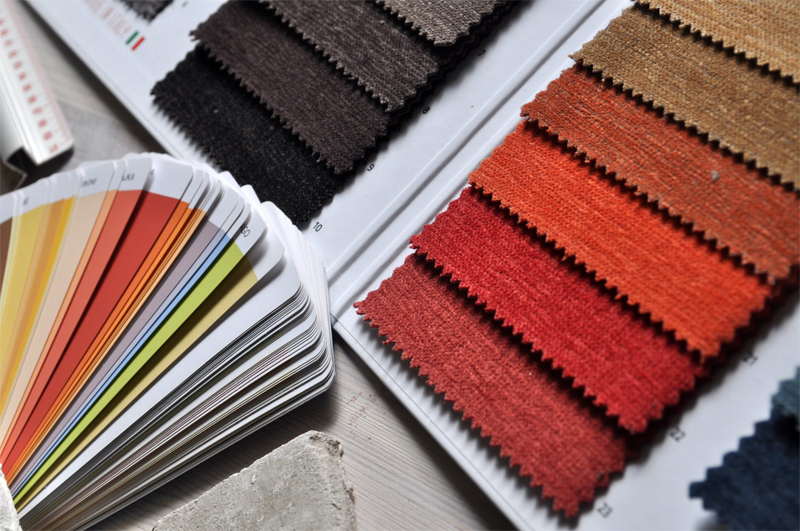 These special fabrics have become the foundation of my fabric collection. Just like some people collect elephants or frogs, I collect fabric. I have “collected” certain fabrics over the years and every now and then I will take them out of my cupboard, place them on my sewing table, look at and touch them, sometimes even iron them and place them over the back of a chair so I can admire them. And then I will return them to the safety of my little collection in my cupboard and bring them out another day. I rarely ever use this special collection of fabric, though I have on occasion and that’s OK too. I don’t care what happens to my fabric stash or collection when I check out of this world. I don’t care that my kids may be shocked at how much fabric I have. I’m hopeful that I’ll have the opportunity prior to my demise, to pass on my stash to quilter friends who will be able to use it. Remember quilters, it’s the journey, not the destination that matters!